The Pacific Islands Forum Fisheries Agency (FFA) and the Office of the Pacific Ocean Commissioner (OPOC) - in partnership with Conservation Strategy Fund, the Conservation Finance Alliance and the Wildlife Conservation Society - are pleased to invite applications for the Pacific Ocean Finance Fellowship Program. This fellowship program is part of the Pacific Ocean Finance Program (POFP), which is Component 3 of the Pacific Regional Oceanscape Program (PROP) - funded by the World Bank and the Global Environment Facility - and implemented through FFA and OPOC. The aim of the Pacific Ocean Finance Program is to improve the amount and efficacy of finance for Pacific Ocean governance. The objectives of the Pacific Ocean Finance Fellowship Program are to 1) increase individual capacity of Pacific Islanders by providing professional development training in ocean finance and governance, and 2) advance finance initiatives promoting ocean governance and health both within institutions and across sectors in the Pacific Islands region through a program of mentored projects in fellows’ home countries. The 9-month fellowship program will select, train and mentor 10 outstanding fellows in order to expand the pool of people in the region knowledgeable and skilled in conservation finance and to increase positive investment decisions, business models and policies for ocean health at local and national scales. Pacific Ocean Finance Fellows will receive training, financial support and project mentorship between June 2019 and March 2020. The deadline for applications is May 7th, 2019. Selection will be based on the eligibility and selection criteria outlined in the full announcement, available here. The Pacific Ocean Finance Program aims to host a Pacific Ocean Finance Conference in 2019 to support knowledge exchange and capacity building for Pacific ocean finance and governance. The conference will enable all of the various components of the program to be leveraged together to maximise beneficial outcomes and lessons learned. The conference will be held in a regional city (Suva or Nadi, Fiji, to be determined) in November 2019. It is anticipated that the conference will have approximately 80 participants. The POFP is seeking expressions of interest (EOI) to coordinate the conference. Expression of interest and supporting qualification documents must be delivered to the address below (in person, or by mail, or by fax or by e-mail) on or before 4pm Solomon Islands time on 11 February 2019. Procurement questions may also be addressed to this contact. Download the full, detailed PDF of the opportunity here. The Pacific Ocean Finance Program is pleased to release the new paper entitled "Ocean Finance: Definition and Actions." The purpose of the paper is to define ocean finance and summarise four actions that are necessary for effective ocean finance. 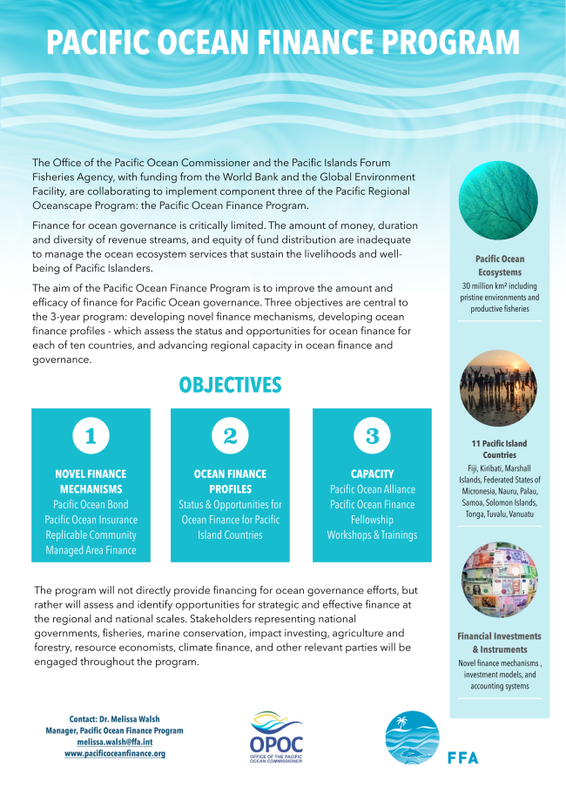 The paper provides guidance for the implementation of the Pacific Ocean Finance Program, the aim of which is to increase the amount and efficacy of financial investments into Pacific ocean governance. You can learn more about the program by visiting the knowledge portal at www.pacificoceanfinance.org.